Obesity is a BIG problem (pun intended). But why? Everybody has their own theory, but this one may surprise you. I think it's primarily because people are increasingly losing control of their appetite control system. That's the system in the body that causes us to want to stop eating. Most people who have problems with their weight don't have a good appetite control system. That makes them feel hungry more often. The result is consistent overeating. But what if I were to tell you that one of the most common things people do to lose weight actually decreases their appetite control system even more? A brand new study backs me up on this. The new study comes out of the Department of Nutrition and Exercise Physiology at the University of Missouri School of Medicine in Columbia, Missouri. The authors of the study found 20 overweight or obese girls from 18-21 years old. All of these girls had one thing in common. They skipped breakfast. The first thing the researchers did was to give the girls a cereal-based breakfast consisting of 350 calories every morning for six days. Other than this breakfast they allowed the girls to eat whatever they wanted. After that, the girls had a second week during which they ate 350 calories of a high protein breakfast consisting of eggs and meat. Finally, during the third week the researchers allowed them to skip breakfast as usual. At the end of each week, the girls went through a sophisticated follow up. They had to complete an appetite and satiety questionnaire, blood sampling, brain scans, and analyzing how they ate during the rest of the day. Here's what the researchers found. The girls reported that their feelings of hunger were reduced no matter what breakfast they ate compared to no breakfast at all. However, compared to the carbohydrate breakfast, the high protein breakfast led to a greater feeling of fullness during the day and much less evening snacking of high-fat foods compared to the carbohydrate breakfast. So skipping breakfast leads to overeating and extra after-dinner snacking. Sound familiar? Every time I ask an overweight patient what they eat, I usually get the same answer. They almost always skip breakfast. And when they do eat it, it's usually carbohydrates like a breakfast cereal and some juice. I have been saying for years that this is a sure-fire recipe for weight gain and overeating. This study makes it clear: The best type of breakfast to eat to help your appetite control is a high-protein breakfast. Over and over I find that by combining a large, high-protein breakfast with calorie counting is the single most effective way to get out of the obesity game. Leidy HJ, Ortinau LC, Douglas SM, et al. 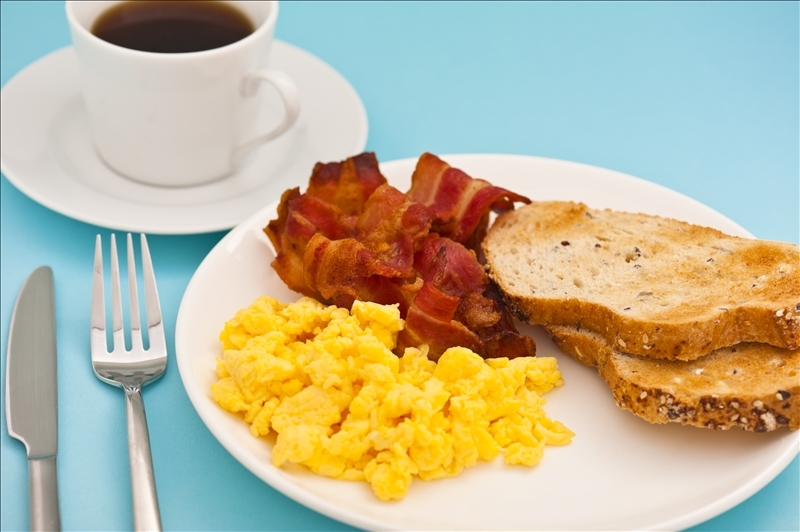 Beneficial effects of a higher-protein breakfast on the appetitive, hormonal, and neural signals controlling energy intake regulation in overweight/obese, "breakfast-skipping," late-adolescent girls. Am J Clin Nutr. 2013 Apr;97(4):677-88.